These complex machines are often very large and are therefore more applicable in industries that yield high emissions such as paper and pulp, agriculture, printing, food processing, polymer and resin manufacturing, pharmaceuticals, painting and more. Not all oxidizers are so cumbersome, however, as they are also implemented in automotive exhaust systems. 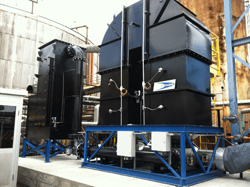 The volume and solvent load of process air stream should be carefully considered when selecting an oxidizer as is the typical temperature range of a system. All of these factors have a significant impact on the destruction efficiency of an oxidizer which is generally between 90% and 99%. Though highly specialized, the basic operation of oxidizers is not overly complicated. An air stream that has been polluted by industrial processing is forced into the main chamber of an oxidizer. The materials are heated to the point where incineration or a chemical reaction occurs, burning and converting the harmful solids or liquids into less harmful byproducts which may then be filtered or collected for disposal. There are two main types of oxidizers, thermal and catalytic. Thermal oxidizers may be regenerative or recuperative with regards to heat transfer and retention. This is essential to lowering operational costs as thermal oxidizers use very high heat to incite combustion of contaminants. Catalytic converters likewise break down hazardous compounds but do so at a much lower temperature. To accomplish this, a noble metal catalyst, such as platinum or palladium, is used to promote oxidation within the combustion chamber. 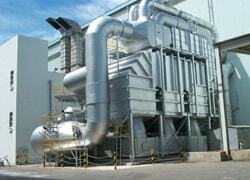 Oxidizers that make use of a rotor concentrator are also growing in popularity. These oxidizers process air flows through a continuously rotating wheel impregnated with adsorbent agents. The type of oxidizer chosen depends largely on the operating space and capacity as well as the specific contaminants in a process stream. Selection should be made carefully to ensure the highest destruction efficiency possible which results in diminished atmospheric pollution. Oxidizers While oxidizers do not inherently eliminate all contaminants and particulates in an air stream, byproducts of the reaction are non-toxic and more easily managed after oxidization than the original pollutants.